Home HVAC Air conditioning Refrigeration cycle, essential knowledge. A fluid, known as a refrigerant, moves between four key stages in refrigeration cycle. As it does so, it changes in pressure and temperature, this allows the fluid to absorb heat from one place and discharge it in another. For a refrigeration cycle to work, it requires five main components. 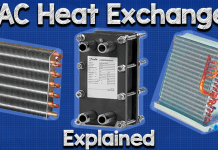 The four key stages of temperature and pressure change occur within these components. To cool a room down, you need to collect the heat and dump it somewhere else. The air in this “somewhere else” must be a lower temperature than the refrigerant for you to be able to dump the heat. To make sure this is possible, the refrigerant is compressed so that the temperature increases. That way when the refrigerant reaches the condenser, the refrigerant within the pipe will be hotter than the air on the outside of the pipe, so it will be able to dump the heat. If the pipe was the same temperature as the air then you wouldn’t be able to reject any heat and you wouldn’t cool the room down. The refrigerant enters the compressor as a warm, saturated low pressure gas, it is then compressed within the compressor (hence the name). 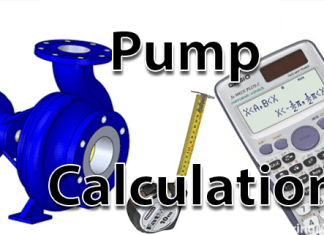 During compression, the quantity of fluid remains the same but the volume decreases, this increases the pressure and temperature. The refrigerant leaves the compressor as a superheated (hot) high pressure gas. Next this superheated high pressure gas enters the condenser, the condenser is a coil of pipework which runs between metal fins. The metal fins help carry heat away from the pipe via conduction. 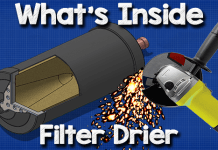 A fan also blows air across the coil and fins to remove the heat via convection. As the air is blown across the pipework and fins, it picks up the heat from the refrigerant and moves it away so that the refrigerant cools down. 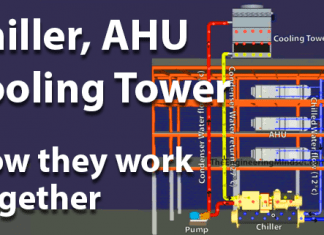 As it cools down the high pressure gas condenses into liquid, which is still at a high pressure. The refrigerant enters the condenser as a superheated (hot) high pressure gas, it dumps its heat into the air being blown across by the fan, this drop in temperature condenses the refrigerant. The refrigerant leaves the condenser as a regular temperature, saturated high pressure liquid. 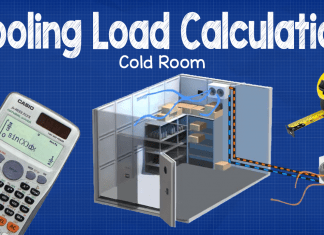 To cool a room down, the heat within that room must be collected and dumped somewhere else. The refrigeration cycle collects this heat by sending the refrigerant at a low temperature and pressure into the evaporator within that room. To cool the refrigerant down it is passed through the expansion valve, this will reduce the pressure of the refrigerant by restricting how much can flow through the valve. This restriction means that there will be less refrigerant in the next section of pipe, so the refrigerant which is allowed to pass through can expand a little. This expansion reduces the temperature and gives it some storage room to collect the heat. 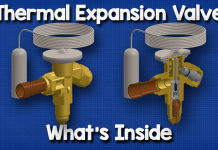 The expansion valve restricts the flow of refrigerant through use of an internal spring loaded valve which is connected to a diaphragm. 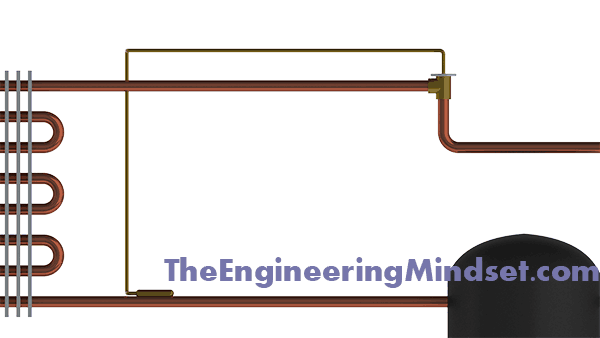 A thin tube, known as the capillary tube, runs between the expansion valve and a thermal bulb. The thermal bulb is in contact with the pipe just after the evaporator, the liquid/vapour inside the thermal bulb expands and contracts with the change in temperature of the refrigerant leaving the evaporator. This expansion and contraction causes the diaphragm to move which in turn controls the spring loaded valve that limits the flow of refrigerant into the evaporator. The refrigerant enters the expansion valve as a regular temperature, saturated high pressure liquid. The expansion valve will limit how much refrigerant can pass through at one time, this results in the refrigerant dropping in pressure and temperature. The refrigerant leaves the expansion valve as a cold, saturated low pressure liquid. 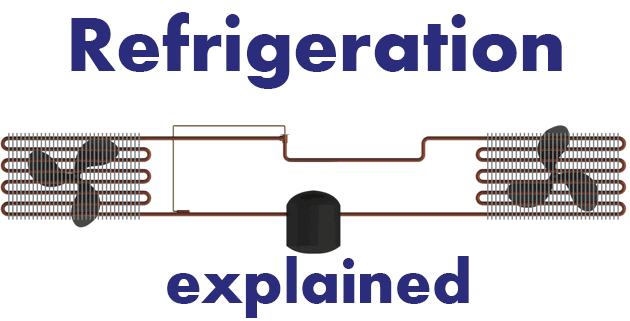 The final key stage of the refrigeration cycle is the component called the evaporator. This is similar to the condenser in construction, but the refrigerant behaves differently inside. 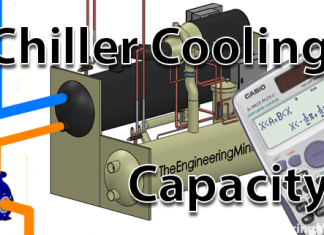 In the evaporator, the refrigerant enters as a cold, low pressure liquid but quickly begins to boil. The refrigerant has a very low boiling temperature, typically of -23ºc (minus twenty-three degrees Celsius). As the refrigerant boils it evaporates, this evaporation picks up the rooms heat and carries it away towards the compressor where the refrigeration cycle will begin again. The refrigerant enters the evaporator as a cold, low pressure liquid, the refrigerant begins to boil and evaporate, this evaporation causes a cooling effect in the room and the heat is carried away to be dumped in the condenser after the compressor. The refrigerant leaves the evaporator as a warm, saturated low pressure gas.